Donald Trump has targeted well over a dozen companies on Twitter since he was elected president. Of course, Trump has had plenty of harsh words for a lot of media companies whose coverage he disagrees with — they make up nearly half the list. A spate of negative tweets from Trump about Amazon (AMZN) cost the company billions of dollars in market cap as investors sold off stock. In total, the companies criticized by Trump employ more than 1.75 million people, and are collectively worth hundreds of billions of dollars. Trump is not the first president to lash out at companies. President Kennedy once attacked steel companies for raising prices, and President Nixon secretly went after news outlets that he thought made him look bad. Unlike Kennedy's attack, Trump's comments don't "seem to be about policy," said CNN contributor Julian Zelizer, a professor of history and public affairs at Princeton University. Historian Timothy Naftali, also a CNN contributor, said that Trump's actions echo Nixon's. "The tactics have changed, but the goals may still be the same," he said. "It appears that the president wishes to discredit his perceived opponents." But unlike Nixon, Trump doesn't keep his grievances secret. Zelizer said that the public nature of Trump's attacks could amplify their effects. Overall, Trump's criticisms are "less scripted," than those of previous presidents, Zelizer added. "There seems to be a more ad hoc nature to how Trump does it," Zelizer said. "This is very different from what we've seen before." The president is wary of the mainstream media in general. But he went after ABC News specifically after investigative reporter Brian Ross made an error in an on-air report about former national security adviser Michael Flynn. Number of employees: Disney (DIS), ABC Television Group's parent company, employed about 199,000 people as of September 2017. Trump's attacks on Amazon have been particularly aggressive. In a string of tweets, he's claimed that Amazon causes the US Postal Service to lose "a fortune," and that the internet giant is skimping on its tax obligations. Trump has also alleged that Amazon uses the Washington Post, which is owned by Amazon CEO Jeff Bezos, as its lobbying arm. Over the weekend, he tweeted: "Amazon must pay real costs (and taxes) now!" The onslaught has sparked fears on Wall Street that regulation could be coming. Number of employees: 566,000 people as of February. In December 2016, before Trump was even inaugurated, the president-elect chastised Boeing for the high price of the new Air Force One plane. Within hours, Boeing (BA) CEO Dennis Muilenburg was on the phone with Trump, congratulating him on his election win and pledging to control the jet's cost. Number of employees: More than 140,000 people globally. Trump regularly calls CBS (CBS) one of the "fake news networks." He's also called CBS, among others, an "enemy" of US citizens. Number of employees: About 12,700 salaried and 4,030 project-based workers as of the end of 2017. CNN is frequently under attack from Trump. The president says it reports "fake news," and that the network is "ratings challenged." There has been speculation that the Trump administration may be trying to punish CNN by suing to block the acquisition by AT&T (T) of Time Warner (TWX), CNN's parent company. Number of employees: About 3,000 worldwide. Trump has repeatedly called NBC and MSNBC "fake news." He seems especially troubled by NBC's "Saturday Night Live," which regularly satirizes Trump and his administration. Sometimes, Trump has targeted NBC's parent company Comcast directly. After MSNBC parted ways with former Fox News host Greta Van Susteren, Trump accused Comcast of firing her "because she refused to go along w/ 'Trump hate!'" When NBC News fired Matt Lauer following complaints of sexual misconduct, Trump wondered when Comcast (CCZ) executives would be fired for "putting out so much fake news." Number of employees: Comcast NBCUniversal employed about 164,000 full- and part-time workers at the end of 2017. When Trump enacted his first travel ban in January 2017, chaos at airports ensued. Trump blamed the "big problems" on a Delta Air Lines (DAL) computer outage, which caused delays and led to the cancellation of about 300 flights. Number of employees: About 87,000 worldwide at the end of 2017. Trump laid into ESPN in September 2017 after anchor Jemele Hill called him a white supremacist. He said on Twitter that ESPN was "paying a really big price for its politics (and bad programming)" and asked the network to "apologize for untruth." He explicitly took on Hill in October, tweeting: "With Jemele Hill at the mike, it is no wonder ESPN ratings have 'tanked.'" Number of employees: ESPN, also owned by Disney, employs bout 8,000 people globally. In September and October 2017, Trump said "Facebook was always anti-Trump," and that the company had been on Hillary Clinton's side during the election. He criticized Facebook (FB) amid discussions of Russian meddling in the 2016 election, and reports that Russians targeted Facebook users with political ads. In January 2017, President-elect Trump threatened General Motors (GM): Make the Chevrolet Cruze in the United States, or pay a "big border tax." Two weeks later, GM said it would invest at least $1 billion in US factories, and committed to creating or retaining about 7,000 jobs in coming years. Number of employees: 180,000 hourly and salaried employees. In December 2016, Trump tweeted about the "tremendous" costs of Lockheed Martin's stealthy F-35 fighter jet, and said he would consider buying Boeing's F-18 Super Hornet for the military instead. Shortly thereafter, the CEO of Lockheed Martin (LMT) gave President-elect Trump her "personal commitment" to cut the costs of the F-35 program. Number of employees: About 100,000. Merck (MKGAF) CEO Kenneth Frazier was the first executive to step down from one of Trump's business advisory councils after Trump blamed "many sides" for the violence at a white nationalist rally in Charlottesville. Within minutes, Trump attacked both Frazier and Merck. He tweeted: "Now that Ken Frazier of Merck Pharma has resigned from President's Manufacturing Council, he will have more time to LOWER RIPOFF DRUG PRICES!" Number of employees: About 69,000 as of Dec. 31, 2017. It's no secret that Trump has made a habit of criticizing the "failing New York Times (NYT)" for its coverage of him and his presidency. In January 2018, when publisher Arthur Sulzberger handed the business to son A.G., Trump marked the occasion by imploring the younger Sulzberger to "treat the President of the United States FAIRLY." Number of employees: 3,790 as of the end of 2017. Trump slammed the National Football League throughout the fall for failing to force players to stand during the National Anthem. His comments put the NFL at the center of a tense nationwide debate on racism and patriotism. NFL commissioner Roger Goodell was ultimately forced to respond. He said that while the league would like players to stand for the anthem, it wouldn't change the rules to require them to do so. Number of employees: About 1,200. In February 2017, Nordstrom (JWN) said it wouldn't purchase Ivanka Trump brand items for the upcoming fall season, citing declining sales. Trump blasted the move on Twitter, claiming that his daughter had been "treated so unfairly by @Nordstrom." Number of employees: 72,500 in 2017. Toyota (TM) announced its plans to open a factory in Guanajuato, Mexico, in 2015. Then, in January 2017, the president tweeted that the automaker would face a "big border tax" if it didn't build the Corolla plant in the United States. In August 2017, Toyota said it would build the Corolla at a new, $1.6 billion US manufacturing plant, and would make Tacoma pickup trucks at the Mexico plant instead. Trump hailed the move as a "great investment in American manufacturing." Number of employees: More than 364,400 as of March 31, 2017. 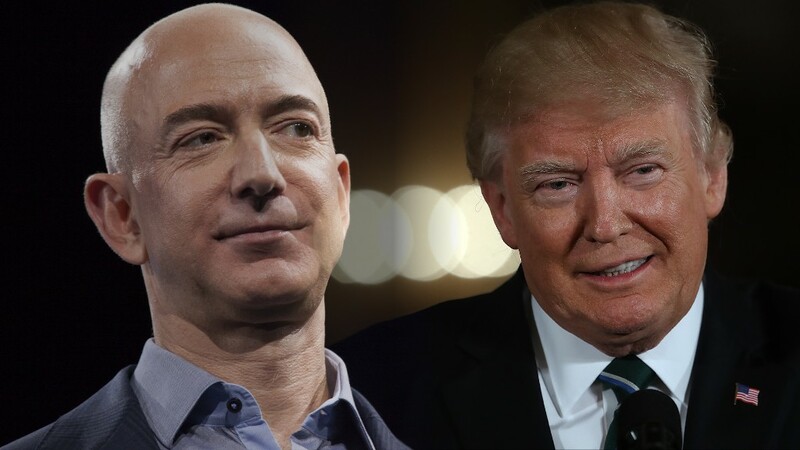 Trump has criticized Amazon CEO Jeff Bezos' ownership of the Washington Post for years. But now that Trump is president, he has a much larger platform. Last July, he tweeted: "Is Fake News Washington Post being used as a lobbyist weapon against Congress to keep Politicians from looking into Amazon no-tax monopoly?" In the past week, Trump reiterated his claim that the Washington Post is a lobbyist for Amazon, and said the newspaper should register as such. Number of employees: The Washington Post doesn't share its total number of employees. There are about 800 people in its newsroom.